Writing an obituary differs slightly in each culture, but in general, the main theme of an obituary is to recap a loved one’s life. When writing an obituary, most of us try so hard to encompass the bright light and spirit our loved one had, as well as overall accomplishments he or she experienced during their time on earth. If you’re preparing to write an obituary, ask your older relatives if there are any customs you should be mindful of based on your religion. 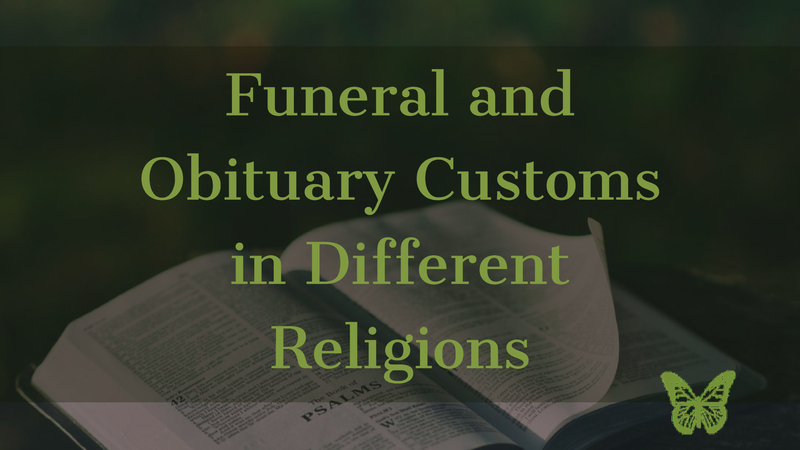 Many religions have unique traditions and customs for funerals, including the information used in the loved one’s obituary. There are several common elements in a Catholic funeral including a vigil, a funeral mass and a graveside service. The obituary will feature what most of us would call ‘traditional’ information about the individual - his or her birthdate and place, spouse, children and relatives who preceded them in death. It will also include public information about the mass and graveside service. In a Greek Orthodox Funeral, guests traditionally greet mourning family members with the phrase, “Memory Eternal”, which refers to the remembrance of God. Believers will kiss a cross that lies on the chest of the departed. A priest leads the service and reads selections from The Divine Liturgy. There is also a graveside service, where loved ones place flowers on the casket. Again, the obituary will include family information along with dates and times for services so that those who wish to do so may pay their respects. For a Jewish Funeral, the family will contact their rabbi and synagogue, who will then make most of the arrangements. Judaism has a very strict and structured period of mourning, called the ‘Shiva’. The purpose of the Shiva is to provide comfort and support to the family of the deceased during this difficult time. There is never a cremation or open casket, and the funeral must take place within 24 hours of death. Because of this, an obituary will feature family information as well as when the funeral took place. It is more of a memorial or keepsake than an obituary giving information to the general public so that people can pay their respects. There are many different traditions and customs that must be kept based on an individual or family’s religion. If you have any questions, call us anytime at 251-634-8055 or connect with Ascension Funerals & Cremations and Forest Lawn Funeral Home on Facebook and Twitter! Ascension Funeral Group serves the Mobile, Alabama area with funeral and cremation services, grief support, pre-planning, and more. Visit us online at www.AscensionFuneralGroup.com!